I can’t begin to thank you enough for bringing Joey into our lives. 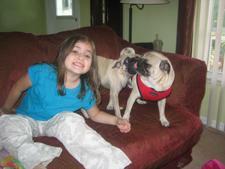 He and Suki, our other pug, act as if they’ve lived together forever and he’s wonderful with my children. He is definitely the typical pug: sweet natured, mellow and a little chubby! Well, we’re working on that last one! Joey seems very happy at home with us and we take him out to the park, the pet store and car rides a lot. He loves the attention he gets from everyone (they always notice his long tongue!). Again, thank you to everyone at CPR for the wonderful things you do for needy pugs.